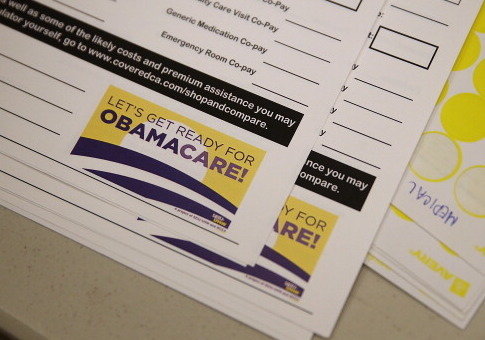 There are 5.8 million uninsured individuals who could purchase an Obamacare plan for less than the cost of the penalty for not having health insurance, according to a report from Kaiser Family Foundation. Obamacare's individual mandate requires that Americans have health care coverage or pay a penalty to the IRS. Currently the penalty totals 2.5 percent of family income or a flat fee of $695 per adult and $347.50 for each child, up to a total of $2,085 for the family. The Kaiser report evaluated uninsured non-elderly individuals who can enroll in an Obamacare plan to see how many would be better off financially if they enrolled in a plan rather than paying the penalty. "While the percent of the population without health coverage has decreased substantially since the major coverage expansion in the ACA, about 10 percent of the population is still uninsured," the Kaiser report said. "Some of those who remain uninsured are eligible for premium subsidies large enough to cover the entire cost of a bronze plan, which is the minimum level of coverage people can buy to satisfy the individual mandate." The report found that next year an estimated 71 percent of the uninsured will have to pay a penalty for not having insurance. According to the foundation, 54 percent of the uninsured who are eligible for subsidies could sign up for a bronze plan next year that would require no premium contribution after the subsidy kicked in. Another 16 percent could sign up for a bronze plan that would cost less than the penalty. "Altogether 70 percent of subsidy eligible-uninsured (5.8 million people) are able to purchase a bronze plan for nothing or less than the cost of the individual mandate penalty," the report states. "Just over half (54 percent) of uninsured individuals who are eligible to purchase a marketplace plan with or without a subsidy would better off financially if they purchased a bronze plan rather than remaining uninsured." The reason, however, that these individuals may continue to opt for the penalty, according to Sally Pipes, president and CEO of the Pacific Research Institute, is that the Kaiser report is only taking premiums into account—not copays, deductibles, or other out-of-pocket costs. "Bronze plans only cover about 60 percent of expected costs," Pipes said. "So even if Obamacare's tax credits effectively cover the premiums for a bronze plan, beneficiaries will still face thousands of dollars in expenses when they try to actually use their coverage." "Many healthy Americans would prefer to pay the penalty for going without coverage than buy health plans with such meager benefits and hefty cost-sharing," she said. This entry was posted in Issues and tagged Health Care, Health Insurance, Individual Mandate, Obamacare, Obamacare Exchanges. Bookmark the permalink.